The following is a guest post from regular contributor, Kalyn at Creative Savings. For the first time in a long time, my personal planning system went completely digital for 2014. It worked well for a while, but as my schedule continues to grow, I find I’m not able to maintain my digital calendar like I used to. So this year, I’m shifting back towards paper, and needless to say, I have been inundated with what seems like hundreds of planning options! From free printables, to spiral bound notebooks, to even creating a DIY planner from a Moleskine journal……the journey to find that perfect planning system has been incredibly overwhelming to say the least. I can’t even begin to imagine how it must feel to those don’t know where or how to start, especially if you’ve never picked out a planner before. 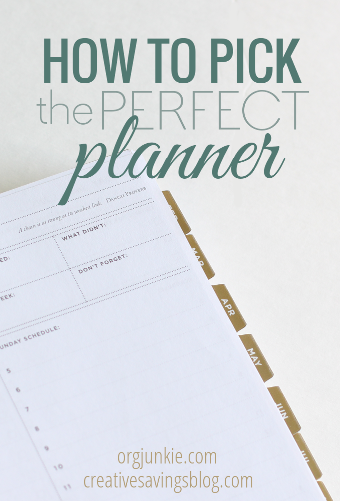 As I’ve done much of my own planner research, I thought it would be fun to share a few tips I picked up along the way, particularly what I consider to be the 3-step process for how to pick the perfect planner. 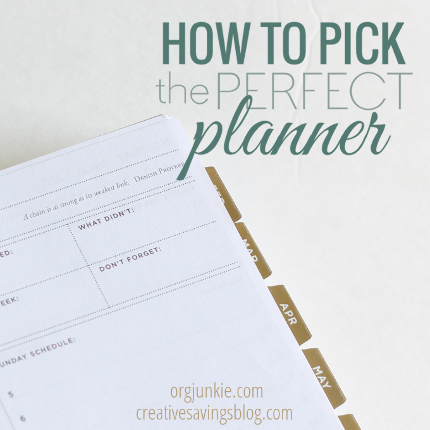 While I’m not going to advocate for or recommend a specific planner in this post, you’ll be well on your way to choosing an effective planning method all by yourself, and just in time for the new year! First, think about how you mentally structure your day. Do you prefer to schedule every hour, or tackle the day as it comes? Are you a list-maker? A goal setter? Do you have a morning and evening routine? If not, do you want to create one? By taking just a few moments to figure out how you want to personally work through the day, you will automatically narrow down all those planning options to the absolute best fit. For instance, if you like daily lists to make sure everything gets done, pick a planner that will break down your day into a manageable schedule. If you prefer planning each week as opposed to every day, pick a weekly spread to help manage your time. And if you just need a month at a glance to list out important events and activities, make it simple and purchase a monthly planner instead, or go digital with a smartphone app like iCalendar. For those who currently use a planner, write down the things that are and are not currently working for you. How could this layout work better? What would make your to-do’s easier to accomplish? Use these questions to help pick your perfect system! I cannot stress how important it is to make sure a planner will work for you before you buy it. There are planners that range from $12 to $59, and each of them have different features that you may or may not need. You can do a general search on YouTube for planner reviews, or break it down even further and search for a review of a specific product. There are even comparison videos that pair and analyze two similar planners from different companies so you can make a well-informed decision no matter which one you buy. I know it always helps me to see the planner in action before purchasing! There are also some planners that allow you to download a sample page just to try it out for a day or two. I did this before I splurged on my planner, just to make sure the layout worked the way my brain usually processes. I can’t even begin to tell you how much this helped, and made me even more confident in choosing the right planner for my lifestyle. If you choose the perfect planning system the first time around, you are a miracle. Many of us have worked through multiple planners and systems for years before we found something that worked. I know I’m still tweaking mine! It’s all about experimenting, and finding the right planning system that works for you. And if that changes every few months, it’s more than okay! I honestly believe we will only accomplish as much as we plan, and the key to a good plan is constant evaluation without giving up. But if you’re a planner addict like me, I don’t think you’ll find that too awfully hard! Do You Currently Use a Planner? 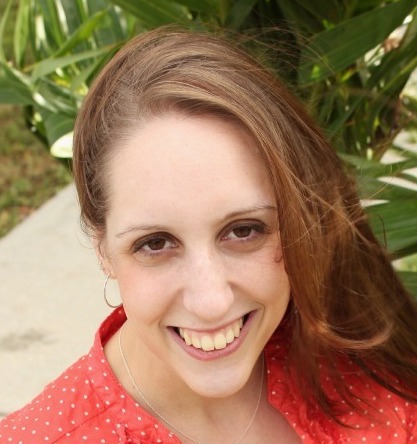 Kalyn Brooke is a full-time writer and blogger at CreativeSavingsBlog.com, where she gives a fresh perspective on frugal living, and the kick-in-the-pants you need to create a budget from scratch. She lives in beautiful Southwest Florida with her news-photographer husband and the most adorable bunny you’ve ever seen. She loves making to-do lists, reading good books, eating chocolate peanut butter ice cream, and pursuing big dreams….all carefully planned out, of course. I am in semi-retirement and I don’t need a ‘planner’ the way I used to, but I am a list maker, often as I sit in the evenings and my mind wanders, sometimes at skull sessions with my husband when we have tasks that mesh and even with Google calender I need the little white board on the refrigerator to remind both of us of appointments or events that are coming up in the next couple of weeks. I will tell you this, methods may change, but in this modern world, good organization is still vital, even for us semi-retireds. Lots of extended family to keep straight too. I love your statement about how methods change, but good organization is vital. This is SO true! I have transitioned to electronic as it allows me to sync my work calendar and home calendar. My family has access to my Google Calendar, so they can check to see if something is already scheduled for that day or add an appointment/game/meeting from their smartphones as well as from the Web. I can send meeting invitations from my work account to reserve dates/time I need to remember a key meeting or office. The family knows they have to check with me before double booking on the calendar and know the key information that needs to work included. . Google Calendar will color code entries, so I know who input the meeting or has to be at an appointment. That is awesome that your family knows to check the calendar before they add new activities. I tried Google Calendar for a while, and it didn’t mesh well enough with the way I organize/think, but I have a ton of friends who use and love it. And the syncing capabilities are great! Actually I’d like to take a closer look at the organizer that’s pictured. Can you give some details about it? Where is the featured planner from? That one is from the Day Designer http://www.daydesigner.com/. I am currently using Erin Condren. I purchased one for 2015. I am liking it! There’s another one I want to try from Inkwell Press , a relatively new company. It can be overwhelming once your on Internet and YouTube! Be careful. I would def follow tips in this article! Thanks! You’re welcome, Dana! Yes, YouTube and pretty Pinterest pictures are super overwhelming if you are a planner addict! I heard that the Happy Planner at Michael’s is half the price and very similar to Erin Condren. I’m thinking of checking that one out. I’m barely starting my hunt! And I’m already overwhelmed! There are just so many with so many different options! I love the ARC system available at Staples. I have been using it for a few years and it has so many options available to customize for your needs. I use an electronic calendar for events I need to share. I have been using Google calendar, but would like to change, and will appreciate recommendations. Great article! I’m a retired senior with health issues. I need to make sure I do physical movement hourly, arthritis and fibro makes life challenging. A planner page for each day with sections for Meds, supplements, exercise, meals, water intake, and appointments, and with a section to write our relaxing craft time or reading time. This would be my perfect planner. I keep searching 🙂 looking for something that would adapt for all these needs. I have two planers to use FC and a DT. Thanks for the great article. I use a planner. I’ve used bunches of different things over the years. As my daily life, schedule and responsibilities change, so does the type of planner that works for me. The one that I have come back to repeatedly is Franklin Covey, either in compact or regular size. It’s what I’m using now, with a July-June calendar. It gives me the right combination of structure and flexibility. Who would have known how serious and overwhelming choosing a planner could really become! I’m really looking to renovate my life a bit and have decided that organization and DE-cluttering are going to be key! I am currently on the hunt for a 2016 planner that I will use on a daily basis. I guess I always strayed from daily planners because my mom would always spend so much money on them and to me it never really looked like she used them effectively. But I definitely feel that this is going to be a key tool in helping me stay focused, organized, and prevent myself from becoming overwhelmed in the upcoming year.Thanks for the tips!